Boil 2 cups or rice with half cup lentils, half cook it, strain some water, leave a little, in rice, slice potatoes in wedges add salt and food coloring and fry, set aside once done. Boil 4 eggs, once done peel and set aside. Braise one large onion, spices, curry leaves,few green chillies, add ginger garlic. Fry a bit more, add 1tsp dhania geera, tumeric, 2tsp chilli powder, 2tsp pickle masala. Add tomatoes or puree, cook a bit more, add your rice and potatoes and salt. 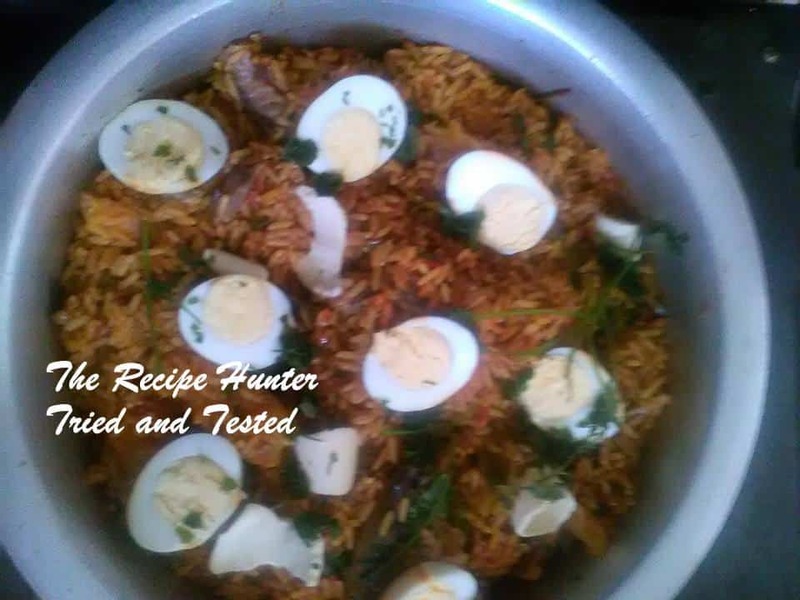 Put in oven for few minutes at 180 degrees, once your rice starts to fluff up, add tinfish and give it a stir, not over stirring,once cooked add butter and eggs, fry onions to decorate optional.